A diesel particulate filter (or DPF) is a device designed to remove diesel particulate matter, more commonly known as soot, from the exhaust gas of a diesel engine. DPF’s can remove 85% or more of the soot from the exhaust. Some filters are designed to be single use filters and are intended to be replaced when they become full of accumulated ash. More commonly others are designed to burn off the accumulated soot by either using a catalyst or by introducing fuel to the filter and igniting it to soot combustion temperatures. This system works by increasing exhaust temperatures via special engine programming and then injecting fuel into the exhaust system which then reacts with a catalyst to burn off accumulated soot and convert it to ash which is then filtered and stored in the DPF. This is known as filter regeneration. When too much ash deposits into the DFP, cleaning is required as periodic maintenance. Fuel injector or turbocharger failure can result in contamination of the filter with raw diesel fuel or engine oil which then requires immediate cleaning. Regeneration of the filter occurs at highway speeds therefore trucks that are only driven in town (refuse trucks, city busses, etc) can require extra maintenance. That is when Maas Radiator can help! Our proven cleaning process will get your DPF cleaned right the first time. When your filter arrives at our facility we weigh the filter to obtain its initial “dirty” weight. Next, we use a proprietary thermal extraction process to burn the soot and ash. 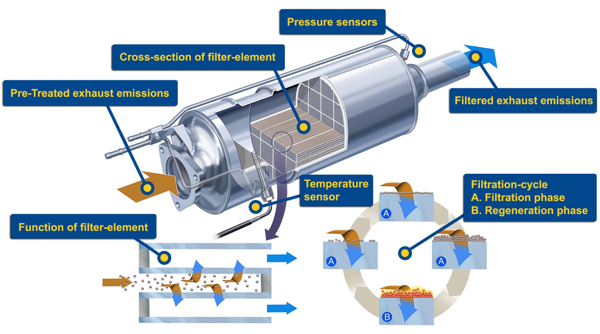 The most important difference between our cleaning method and systems others use is the thermal extraction process because the heat will also dry the filter if there is unburned fuel or oil in the filter – something air pulse systems can not achieve. Without a dry filter and all the soot turned to ash, the next part of the cleaning process is quite difficult. After running through our thermal extraction process the filters undergo a pneumatic cleaning phase which physically removes any remaining debris from the filter substrate. Our system allows our filter cleaning technician to visualize the cleaning process and monitor each area of the filter to ensure the entire filter is cleaned. Many air pulse systems are automated and not monitored by a technician so they can not ensure the filter is properly cleaned. After visual inspection and the exterior of the filter is cleaned and the filter is weighed again to determine how much material was removed. With a turn around time of less than 24 hours, you will be back up and running in no time! Your trucks will run cleaner and more efficiently which will save you money! Better flow through the filter after cleaning will increase your fuel economy. Extend the life of your trucks or equipment by performing regular maintenance. Our quick turn around keeps your fleet of one or hundreds of trucks or equipment running and making you money. We can supply aftermarket DPF & DOC's for much less than OEM filters! How often should my DPF be cleaned? Every filter requires regular and routine maintenance. Just like other preventative maintenance tasks, regular filter cleaning will save you money and down time. You should consult your equipment manufacturer for exact DPF cleaning intervals, but generally speaking filters should be cleaned annually or based upon mileage determined by the manufacturer. No problem! We can clean that too and since it cleans more easily than the DPF, it costs less. In fact, most customers will have us clean both the DPF & DOC at the same time. What benefits can I expect from regular cleanings? 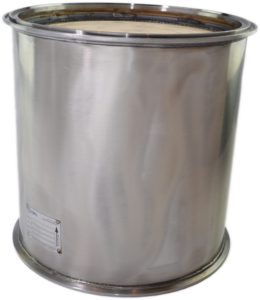 Regular DPF cleaning will normally restore engine performance, increase fuel efficiency, reduce regeneration, extend filter life and reduce down time and maintenance costs. How effective is the cleaning process? While our propriety cleaning method achieves excellent results and restores your filter to nearly new conditions, there is not way to remove 100% of the ash from the filter. Some of the ash deposits into the filter walls and cannot be removed. Our typical turn around time for filter cleaning is less that 24 hours. In fact, if a filter is dropped off by 4 pm it can usually be ready by 9 am the following morning. If, however, the filter is extremely dirty and requires additional time in our thermal extraction process it can take longer. If the filter is a welded assembly, can you still clean it? Yes! We have a weld shop in our facility and we can remove cones from the filter or cut the filter apart, clean it and then weld it back together. What if my DPF cannot be cleaned, is cracked or has physical damage? No problem. We can source many aftermarket DPF’s for much cheaper than prices from he OEM.